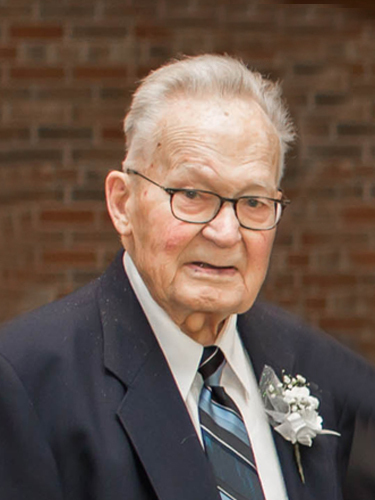 Darrel A. Carlson, age 87, life-long resident of Parkers Prairie, died peacefully surrounded by his wife and family, on Friday, January 25, 2019, at Grand Arbor in Alexandria. A funeral service will be held at 11 a.m., Friday, February 1, 2019, at First Evangelical Lutheran Church in Parkers Prairie with Rev. Rachel Stout officiating. Music is provided by organist, Pam Wenzel and vocalist, Michael Peterson. Burial will take place at Parkers Prairie Cemetery. A visitation will be held from 4-7 p.m., Thursday, January 31, 2019, at First Evangelical Lutheran Church and continue one hour prior to the service. Darrel Arno was born on April 29, 1931, to Christopher and Elna (Olson) Carlson at home in Parkers Prairie. He was baptized and confirmed at First Evangelical Lutheran Church in Parkers Prairie. He graduated from Parkers Prairie High School in 1949, then attended one year at the University of Minnesota, St. Paul where he studied Agriculture. Darrel returned to Parkers Prairie where he was united in marriage to Margaret "Marge" Inwards on July 25, 1953 at First Evangelical Lutheran Church. Following their marriage, Darrel was a life-long turkey grower and farmer in Parkers Prairie Township as Carlson Turkey Farms. In 1956, he was a founding member of West Central Turkeys in Pelican Rapids, 1963, he was a founding member of (FPA) Feed Producers Association in Perham. In 1966, he started Carlson Trucking in Parkers Prairie. He was a Minnesota Turkey Growers Director from 1978-1984, President from 1983-1984. He was a Parkers Prairie District Hospital Board Member for 15 years. Darrel was involved in First Evangelical Lutheran Church Council and life-long member. He thoroughly enjoyed singing with the men’s quartet, which included Warren Carlson, Gene Inwards and Kerman Larson, accompanied by his wife, Marge. His hobbies included investments, traveling, fishing, and hunting. He especially enjoyed time spent with his family. He was preceded in death by his parents; brother and sister-in-law, Howard and Theora “Teddi” Carlson; step-mother, Angie Carlson; and brother-in-law, Al Butler. Darrel is survived by his wife of 65 years, Marge; six children, Diane (Rafa) Elmajri of Woodbury, Mark (Sue) Carlson, Terry (Janet) Carlson both of Parkers Prairie, Kevin (Diane) Carlson of Woodbury, Dean (Michelle) Carlson of Eden Prairie and Amy (Lyle) Oeltjenbruns of Parkers Prairie; brother, Warren (Judy) Carlson of Parkers Prairie; sister, Gloria Butler of Waseca; 18 grandchildren, Aisha (Kofi) Robinson, Aliya (Andrew) Sullivan, Youssif Elmajri, Layla Elmajri, Nathan (Kayla) Carlson, McKenzie Price, Spencer (Kristen) Carlson, Caroline Carlson, Amanda (Tom) Sanvik, Brad (Carlye) Carlson, Brittany (fiancé, Travis) Carlson, Brandon Carlson, Brett Carlson, Brianna Carlson, Danielle Carlson, Chad (Brianna) Oeltjenbruns, Jesse Oeltjenbruns and Kali (Tyler) Hoppe; 14 great-grandchildren, Evan Knofczynski, Asher and Kai Robinson, Sawyer and Rowan Sullivan, Payton, Brylee and Raelyn Carlson, Cade and Ben Sanvik, Venna and Dawson Carlson and Caleb and Gracie Oeltjenbruns. Pallbearers are his eight grandsons, Youssif, Nathan, Spencer, Brad, Brandon, Brett, Chad and Jesse. Honorary pallbearers are Warren Carlson, Roy Olson, Gary Raymond, Roger Doble, Jim Inwards and David Olson. Memorials preferred to the First Evangelical Lutheran Church Projection System Fund. Although Marge is at Grand Arbor, please send all cards and well wishes to P.O. Box 49, Parkers Prairie, MN 56361.